“I’ve been, searching, for that missing productivity application.” OK, it doesn’t end with quite the same rhythm as Michael W. Smith’s “MIssing Person,” but it rings true for me anyway. Sometimes I think I’ve tried nearly every todo, productivity, and Getting Things Done software or web application invented. Then I look around the web for them, or stumble on another one, and I realize I haven’t seen it all and, of course, I have to try it. The result is usually “cool,” and I might use it for a day or two. And then, I forget about it. (I use and love the HelpSpot helpdesk software (Lakeview is even a HelpSpot case study! ), but there are tasks (and projects) I’d like to manage outside of requests in the helpdesk, and that’s just an at-work solution.) Now that I have an iPhone, although it comes with no built-in task managment program (why? Beats me), I figured someone would have made a system I could use on my desktop, laptop, and iPhone to track todo lists at home, for Lakeview, and for the Indianag A/G District Office where I work one day per week. And when I’m somewhere else, I don’t really want to see what I have to do anywhere but where I am! And oh yeah, I’d like subtasks support, tagging, sorting, searching, start and end due dates, and due time with reminders built in, and probably a few things I’m forgetting. And can you make it free while you’re at it? I don’t recall exactly how I discovered it, but it was probably a Google search or a post comparing services that led me to Toodledo. The name almost turned me off from looking at it at all. It’s a nice play on words but not as “professional” sounding as I was looking for. But hey, Remember the Milk isn’t all suit-and-tie sounding either, so I gave it a shot, especially because it had a free iPhone interface called Slim. The well-done feature comparison chart also helped to convince me to try it out, given it’s completeness compared to every competitor listed (granted, the chart is a bit out of date per a few forum postings especially in relation to Todoist, which I tried briefly after I was already using Toodledo (always on the lookout for something closer to perfection :-) and if you like using the keyboard extensively it may be an excellent option, although I’m not sure about an iPhone version). Of course comparison charts are intended to be biased towards the company making the chart, but the list of features Toodledo had was impressive by itself. This is going to get long, so for more information I’m breaking the rest out after the jump if you’re reading this on the web! After customizing the fields I wanted to use (most of them, it turns out) and playing with the Contexts feature which lets you save a location or context for each todo item, I started to actually put a few tasks in for the next few days to get a feel for how to use it in a daily workflow. It clicked. I still find some interface things to be not as easy as they could be, but I like Toodledo so much that I’ve purchased a Pro account for $15 per year to unlock some additional features. The fee is more reasonable than any other pro account I’ve encountered for task management, and although my preference is of course for stuff that’s free, the Pro account just added enough value at a small enough price to make it worthwhile (subtasks and longer completed-task history retention were the two that put me over the edge, but the Scheduler and Stats features are also nice). However I haven’t seen the need for a 1GB file storage area that doubles the price, so I stuck with a Pro rather than a Pro Plus account; the file storage and going from 2 years of completed-item retention to forever are the only additional features for the upgraded plan. The definition of what I look for in a productivity app keeps changing. Universally available todo lists with all the features I’ve mentioned were the biggest need I had and Toodledo fills that void nicely. Some people, especially those using the GTD system, use Toodledo to track projects (GTD defines a project as “anything requiring more than one specific action to complete” while I both like that and have an additional one, something like “something I want to get done including collaboration with others” or something along those lines). Toodledo provides task sharing (read-only unless the other user has a Pro account) and you can use Toodledo’s Projects field to track GTD-like projects, but at work I’m still missing something between todo list and helpdesk. What I’m looking for is Project Management. Something like Microsoft Project without the complexity, on the web, for one to several people working together on multiple projects to use for tasks and collaboration. There are nearly as many options in this space as there are todo list services! The most well-known of these is probably 37signals‘ Basecamp and their associated services (like Backpack, for todos and calendaring–but it’s not free!). Basecamp is nice but their free account only allows for one project, and their paid accounts are more than I’m willing to shell out for right now, and they don’t offer non-profit discounts (I asked). That’s OK, copycats are a dime a dozen, but the problem is finding the one that does everything the way I want it to, at the right price! Unlike Toodledo, I’ve not discovered the perfect-enough solution for this yet, but I’m still looking. My biggest concern is that most project management systems include their own todo list system, and I want to make sure I don’t split my nice Toodledo system and have to check two separate todo lists all the time! I’m keeping this in mind as I evaluate. Centrally managing a list like that would be much better than me having to come up with it off the top of my head like I just did! Yes I can just write down a list, and I have a few of those, but that leaves out the collaboration opportunity. One of the few entirely free options I’m contemplating is called ClockingIT. The interface doesn’t seem as clean as some competitors, but it has many features including a Wiki, chat, forums, and files, along with reporting and charting options. And the price is right. This is one of many possibilities several of us in the Church IT IRC channel (#citrt on the Freenode IRC network) discussed a week or two ago when we went Googling for project management options. No one in the group has a perfect solution but several have none (hence the looking! ), and others are using things like Basecamp, Sharepoint (WSS) or Microsoft Project. I refuse to get sucked into using Sharepoint and the other two I’ve already eliminated for reasons above, so that’s why I’m still looking! I’m tracking things that show some promise usingÂ my Delicious keyword “projectmanagement” if you care to browse. For churches, TeamWorkLive stands out as another very nice option, although the price is too steep for me right now. I can see this being a great all-church-staff project management tool, if everyone gets on board and you’re OK with the $200/mo for 50 users (or $150/mo for 25 users…there are other plans too). This is a brief overview of how I use Toodledo. I have most of the fields except for the sharing-related ones enabled. I used Google’s Chrome browser to create an “Application” out of the Toodledo website so I can easily open a separate Toodledo-only window, preventing it from getting lost amid my many tabs (no, I’m not kidding! Too many tabs to provide an exact count right now though…). I have the same setup on the desktop I use at each office and on my laptop, and I have an iPhone home screen icon set up for the Toodledo Slim iPhone webapp interface (I’m also presently using the Appigo Todo native iPhone app, which is nice, but it is missing several features including subtask and context support that prevent it from being as useful in general, even though it syncs well with Toodledo. Appigo has said they are working to add these features in the near future). I have Toodledo set to default to the Contexts tab, since you can select any of the fields to start with by default. This lists all the Contexts I have set up in tabs across the top of the screen, and I can easily select which one to view (the number of tasks in the context is shown in parentheses on the tab but that can optionally be hidden). The main contexts I have (plus a few infrequently used ones) are: Any Computer, Lakeview, District, and Home. I default to sorting tasks by Importance and then Auto. 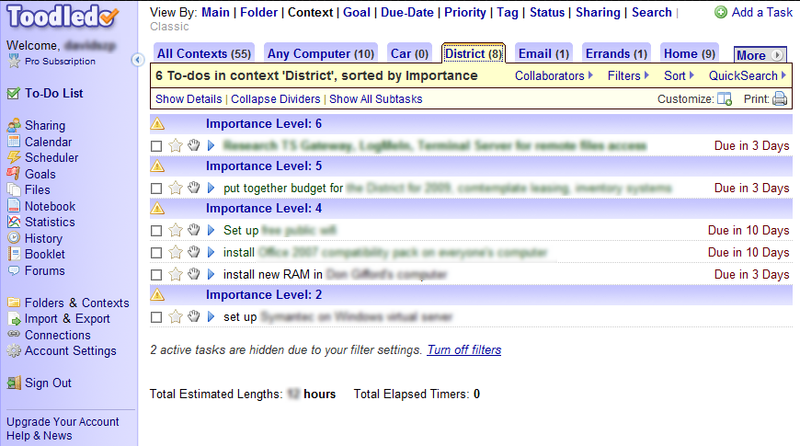 Importance is a foruma defined by Toodledo that takes into account both the priority of a task and how soon it’s due, and assigns each task a numerical value of “importance.” The higher-importance items are shown at the top, and for each task the due date or priority is displayed at the right side (whichever is the reason for the importance level is displayed, due date or priority, per task). A quick scan shows me what I need to do today and I can pick a next action to work on based on only tasks that I can do (that are in the context I’m presently in; at Lakeview for example). I have keyboard shortcuts enabled which lets me type “n” to create a new task quickly, and I can tab through the fields to set the folder, start and due dates, priorities, context (defaults to the context I’m in) and other settings as applies to that task. The Folder field I’m using kind of as a categorization field and kind of as a “project” field, I’ve not decided 100% how I’m going to use it yet. But that’s an example of flexibility; I can use the Folder field for whatever I want however I want to! There’s also a Tags field which allows for multiple, comma-separated tags which you can view and sort just like any other fields. I’m using tags sparingly right now, but will throw “web,” “order,” “blog,” for categorization, or a person’s name (like my boss) to create an agenda to talk to that person about the next time I see them. Subtasks, which are a feature of the Pro account I paid for, are nice but not as easy to use as I’d like. Without seeing or using it I’m not sure I could explain it very well so I won’t try for now. Suffice it to say the usability of the interface for subtasks has a ways to go to make it as efficient or easy to use as it needs to be for me to get much use out of it. Like others on the Toodledo forums, I would also like to see the ability to assign an order to subtasks so as each was marked complete, the next one would be “active” until it was complete, and so on. This would make tasks with subtasks very usable as GTD “projects->next actions” which I would like to get into more in-depth as I work toward trying to implement GTD myself (I am currently trying to use some of the GTD concepts but I haven’t dived in to the program all the way). I presently have 55 active todo items in Toodledo, which is the important suff I can’t forget but is not close to the full brain dump GTD requires to really work well! The iPhone interface is mostly full-featured but obviously limited in the amount of information it can display at once, and the lag time for the webapp to refresh is occasionally annoying. However I use it to enter new todo items at least as often as I use a computer, I think, and I edit and mark tasks complete on it as well (it’s nice that I can review pretty much anywhere when I have downtime, without having to be in front of a computer!). The biggest benefit to having an iPhone interface is that I’m more likely to follow through and use the system the more contstant and “anywhere” my access to it is. I don’t want to rely on something that goes away when I’m not at my computer; that’s when I need to be reminded what I need to do the most! Especially as I’m running around the building away from my office. Between Appigo Todo and the Slim webapp, I get what I need to out of the iPhone side of Toodledo access, but it’s not perfect. 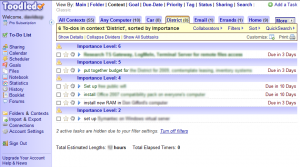 I am looking forward to the Appigo Todo updates that will add Contexts especially (and subtasks! ), and Toodledo developers themselves have mentioned in their forums that they are looking at iPhone native apps themselves but have not released any details about when to expect anything concrete to materialize. Some other ways that Toodledo provides to interface with their system are email, Twitter, and Jott. I have enough ways to add and view tasks on the go that I don’t think the Twitter integration will be very useful to me despite my extensive use of Twitter. Jott is an excellent service that I’ve used for a long time off and on, but recently they switched to a paid model and left beta status. Basic Jotting is still free but connecting to productivity services like Toodledo requires a paid monthly subscription now. If I get desperate enough to need quick voice-to-todo translation I’ll contemplate a subscription; until then I may use the iPhone Jott app to capture quick items that I can manually enter as a Toodledo task later. Email is one piece that I haven’t really gotten into the swing of using but should be pretty powerful, because you can forward an email to your secret Toodledo email address, changing the subject to the actual todo text (add exclaimation points to bump up the priority, and @context to set a context) and the body of the email becomes the task’s note. This should make creating tasks from emails quick and painless, but like I said I just haven’t started using it heavily yet, even though I need to. The same command-shorthand works to create new tasks via Twitter using a Direct Message, by the way. There are several other ways to get information out of Toodledo, including iCal subscriptions, Vista and Apple dashboard or sidebar widgets, a Firefox extension and sidebar (the sidebar uses the same Slim interface as the iPhone), and there’s a third-party Outlook Synchronization Tool that does just what it sounds like, using the Toodledo API. I tried this (it does work!) since I use Outlook but the lack of contexts turned me off and I’ve tried and failed to use the Outlook Tasks feature for tracking todo items, so I’m not sure why I wanted to try again :-) You can display your tasks in your Google Calendar in at least two ways (as a drop down item each day to see tasks due that day, or as actual calendar items if you’ve set a due time as well), and you can get text-message or email alerts about an hour before a task with the due time field set is due (for now, you can’t configure how early to remind you, and if on, all tasks with a due time will remind you up to the maximum number of reminders you want per day). Is Toodledo what I’m going to use long-term? Well, I’ve spent about $25 on Toodledo Pro for a year, and the Appigo Todo and Notebook iPhone Apps. I’ve been using the system for about a month I think, successfully, and with money invested I (hope) I’m nore likely to stick with it longer. Only time will tell! It’s full-featured yet flexible, but it doesn’t quite provide the collaborative project management that I’m also looking for, which may end up being another tool to juggle when I find the right one, rather than replacing Toodledo. Sometimes you just need a nice, smart, flexible list to give your mind some sanity by offloading the “stuff” to the system. That’s the premise of GTD, and Toodleso is my favorite implementation so far. I just have to be careful to avoid something I recall reading on Merlin Mann’s 43folders blog a while ago (I’m not sure what article) that mentioned it was too easy to spend more time looking at, examining, and setting up a system that you more busy with that than actually using it! I agree, that is easy to slip into sometimes! I guess I’ll just have to stop and use this for while! Great post. I’ve been looking at TODO apps forever and they just never “stick”. You always start out feeling like you’ll be more organized, but I always abandon them in a day or two. I’m not sure why this is. Keep us updated on if this actually works out for you. Never heard about Toodledo before. Since I run PM Hut I was interested in the collaboration (which is mainly what Project Managers are much interested in these days) aspect of this product. I have to say that this part didn’t seem to advanced compared to other products (yet you have to take into consideration that this is a free product). A video or 2 (on the toodledo website) would have been helpfpul. @PM Hut: I have not used the collaboration features at all. I’m a one-man department right now so it’s not terribly important, but as I mentioned I’d like to find a good project management option for working with volunteers. I mentioned ClockingIT.com as a free option I’m contemplating, but TeamWorkLive looks nice if you can afford it, too! Both have tasks of course but also a lot more collaboration features. I’m more concerned about accessing my tasks quickly from multiple platforms right now but I do see the need for separate project management as well! If only there was project management software that integrated with Toodledo’s API…but I think that’s wishful thinking unless I write it! Great post. Iâ€™ve been looking at TODO apps forever and they just never â€œstickâ€?. Taskado is a completely free (not just “trial-basis” free) task and project management tool that small teams, whether for profit or non-profit, can use to successfully track task progress, complete projects, and foster team communication. Glad to see you found something that is working well for managing your workflow. Fortunately, there are a lot of web-apps out there, a reflection of how differently we are solving the problems of task management. You should also check out Intervals, a web-based task management tool that also handles time tracking. Thanks for the review. I’d like to add my praise for this web/iPhone app. I’ve been using Toodledo for the past month and it’s been very effective for me. I have 100 open tasks right now and I’ve closed about 60. Between folders, contexts, start/due dates, subtasks, and the iPhone… I’ve found a very effective way to manage the tasks in my life. I’m not a GTD adherent, just someone looking for better organization and tracking of things I need to do. Levi: Sorry for the delay in my reply, but yes I’m still using Toodledo. It’s the longest I’ve ever used one todo product! I’m using it a bit less in the last couple of months because I’ve switched jobs and I haven’t fully gotten Toodledo integrated with my new routine yet (especially since I have to track customer tickets in separate helpdesk software–I used a helpdesk at my last job as well but it wasn’t for billing purposes so minor stuff could just go in todo list), but Toodledo was helpful during my job transition and I’m likely going to start using it more heavily again. The Appigo Todo app for the iPhone has been updated to support contexts, bulk editing, and several other efficient functions, and I’m using it exclusively on my phone instead of the Toodledo iPhone app (although it is also good, less expensive, and has had many features added since I last used it). Also, take into consideration the WorkForceTrack team which enables sharing and integrating of the MS Project, inbox among the team members and other tools are available for successful business people.